Nov 8 2017 - The UN Security Council has once again dropped plans, in the face of likely Chinese veto, to adopt a resolution demanding an end to the violence against the Rohingyas. What we have instead is a formal statement calling upon Myanmar to ensure no further excessive use of military force in Rakhine State, to restore civilian administration and apply the rule of law, and to take immediate steps in accordance with their obligations and commitments to respect human rights. This relieves the mounting pressure on the Myanmar government. But where does this leave the Rohingyas? According to the UN, more than 600,000 Rohingyas have been driven out of their homes, and who must be taken back, as the world body has also stated. And conducive conditions must be created for them to go back. It is ironic that the Myanmar government continues to insist that military operations have ceased against the Rohingyas. If that were the case, why are thousands of Rohingyas still streaming over the border to our side every day? 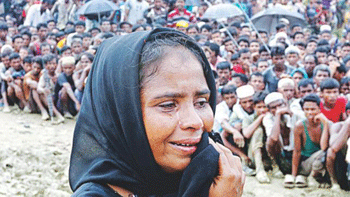 If it is fear that is compelling these people to flee Myanmar, then those fears must be addressed. It is also imperative that the Myanmar government not only expresses public support but also implements the Kofi Annan committee’s recommendations that should be the blueprint for resolving the Rohingya crisis. So, all this foot-dragging by Myanmar now is completely out of place and must stop. And this is what the UN should be demanding. The mere issuance of a statement will not be enough unfortunately. UN must ensure that its call is complied with.